Do you want an app that can help you record and observe incidents in your area? If you do, we are offering you one of the most helpful productivity tools on the Android platform, called PatrolMan. This advanced Neighborhood Watch management system is developed by TCG Cape, and it is very easy to use, with dozens of priceless features and lovely design. PatrolMan only requires you registration. Before doing that, you can check how the app is working and what it contains with logging in with use these details: Username: demo; Company: demo; Password: demo. If you’re satisfied, install the app, register and start patrolling with your own device. You can keep track of patrols, patrol milage, record incidents and even browse through already past incidents in your own area. With the app’s map you will be able to see and identify hot spots areas and know what is going on around you. Scroll through the RSS Feed and read many entertaining and useful reports related to crime trends and incidents. Add photos of any suspicious people or vehicles and use the awesome SOS button in case you need some help from other users. 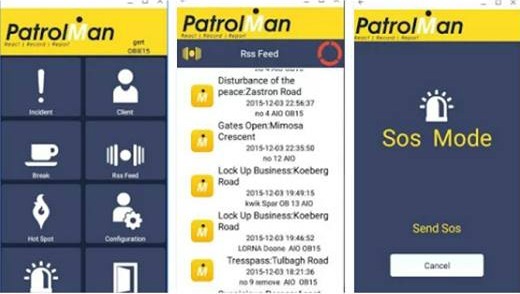 PatrolMan is free for download from Google Play.